This range is new to me as I haven’t thought about using anti-aging products. To be honest, it puzzles me to know when is the best age to use it. This is aimed at the first signs but being 22 now, I can’t see the signs but I have heard many use products at the age of 21. Never too early to start? 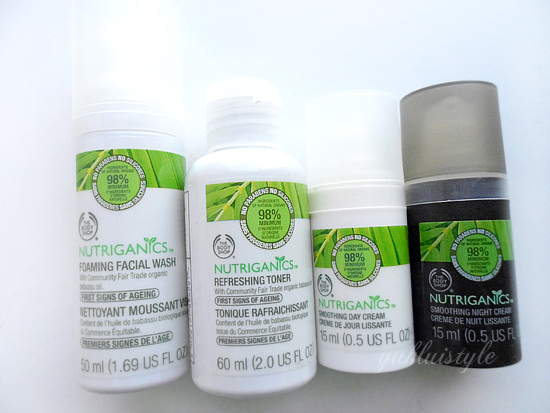 From the name of this range, Nutriganics, it is made from 98% of natural ingredients and x% is organic. It’s typically aimed at the age of 30 – 40 years old. 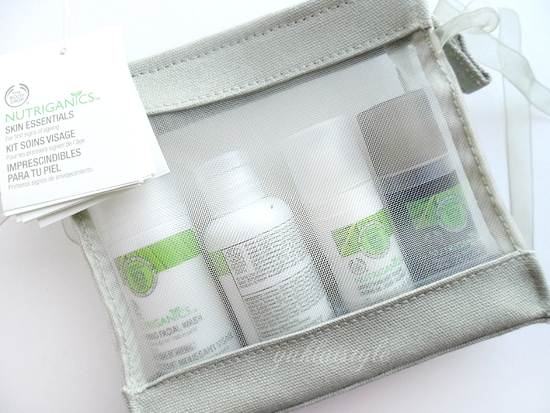 This little gift set consists of a foam face wash, toner, day and night face cream. Great for you try to it out before spending on the full sized products. Great for travel tool. The foam wash is average but cleanses well. The toner (not swatched) is my least favourite. It’s thicker than other toners I’ve used and left my skin with a greasy residue. From the last swatch above, you can see the face (left) and night (right) cream swatch next to each other. The face is cream is lighter than the night therefore a good moisturiser to use during the day in the humid weather. It gets absorbed into my skin quick however being an oily face girl, this does nothing to help control the oils. I’ve tested this out for 3 weeks and I would use this more during the winter rather than the summer. 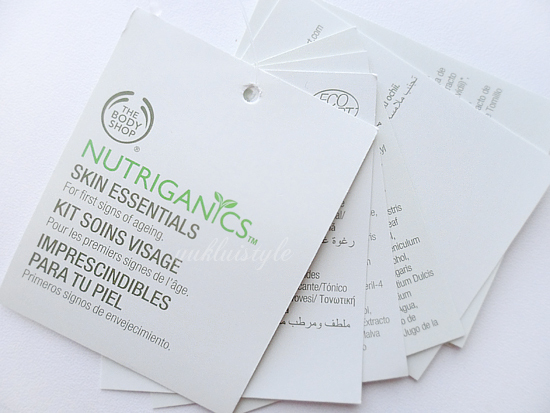 I cannot see a visible difference, but it left my skin feeling smoother, softer and hydrated. This hydration feeling is different, a good different. Has a soft scent, think it’s citrus I can smell the most. Quite pleasant. This range isn’t my cup of tea right now because I still have teenage skin and prone to spot breakouts. Will definitely look into it when it’s the right time and skin is not spot prone anymore. Have you started using anti-aging products? What is the best age to start using anti-aging?